Mac professionals keen on mastering their own Blu-ray movies can finally get started thanks to MCE's internal Blu-ray drive. It supports 50GB dual-layer discs and ships now for $699. You're not spending the better part of a grand just for a drive—on no! 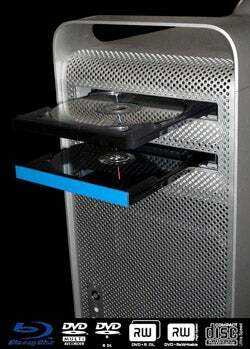 You also get Roxio Toast 8 Titanium, which enables you to write Blu-ray discs from both Finder and Toast itself. As a separate added bonus, Toast 8 comes with a TiVo Transfer program that lets you grab shows off your TiVo. Whether these shows are in HD, we're not sure, that beats not having TiVo capabilities on your Mac.